February is here and love is in the air. In preparation for Valentine’s day, all the stores have already begun to stock their shelves with gifts and cards for people to exchange. Also notice that almost all of the holiday chocolates come in a red box and cards for this holiday tend to be red or decorated with red. It would appear that the color red has taken over the store displays. The reason most of the Valentine’s Day items tend to be red is because red is said to be the color of love. Red is the color of our hearts. Since most people associate hearts with love and romance, red has become the color of love. Red is the most emotionally intense color. It has been said to stimulate a faster heartbeat and breathing. Red is also a color that gets noticed and attracts attention. Red cars are the most popular ones stolen by thieves because it is flashy and attention grabbing. Red is such an eye catcher, they are the most popular color pulled over for speeding tickets!! This Valentine’s Day if you want to grab your loved ones’ attention, incorporate red into your day. Wearing a piece of red clothing will catch the eye of your sweetie. Giving your loved one a red rose or red box or chocolates will show her how much you love her. 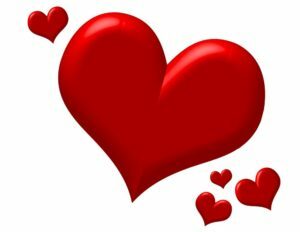 Enjoy your Valentine’s Day and the vibrate color red! ← Know your style in the New Year!